The final red and blue blocks were completed Saturday afternoon. LeAnn's UFO package contained five of the lighter blocks and fabric cut for the remaining ten blocks. I added some red and blue fabrics to brighten the quilt and to make it more of a Quilt of Valor. The blocks were moved around a bit to find a good layout. Brenda, Marilyn and I decided the arrangement in the photo showcased all the blocks the best. After the blocks are sewn together, I'll add a border to complete the quilt. Looks good to me and am sure the border will be the finishing touch. You've arranged it beautifully! 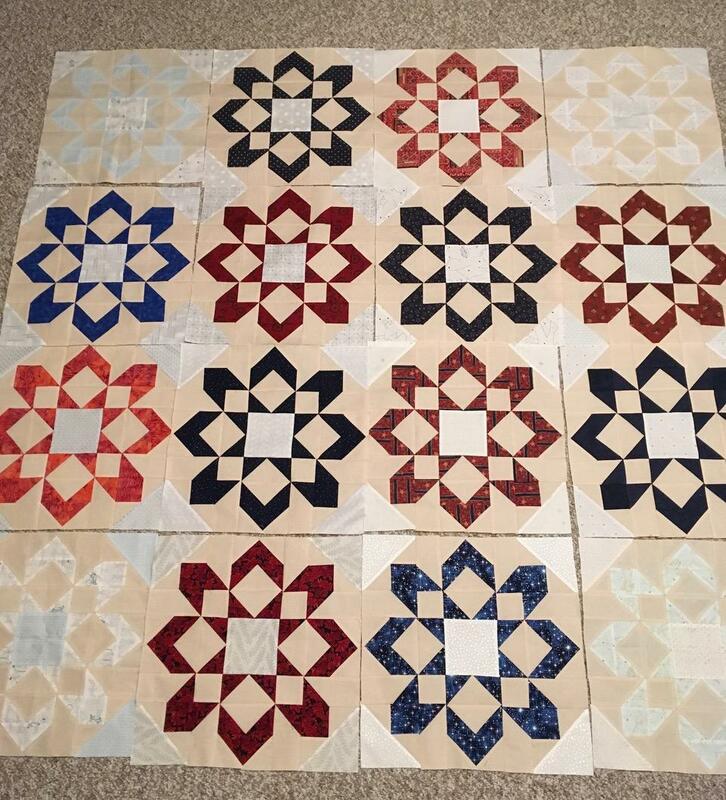 How nice to see it all go together--and you are quilting again! That is really nice! I love the layout. Oh, good golly. That is so pretty!!!!!! Excellent layout! those are really nice blocks! Great job! I really like the layout with those pretty blocks. It is absolutely gorgeous. The layout is perfect. Great going a wonderful sewing start for the New Year. I think once the border is on, those white-ish blocks will pop out so nicely. 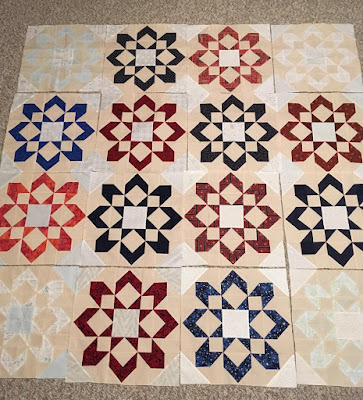 I love the lighter color blocks and where you placed them, it’s going to be a very pretty quilt.